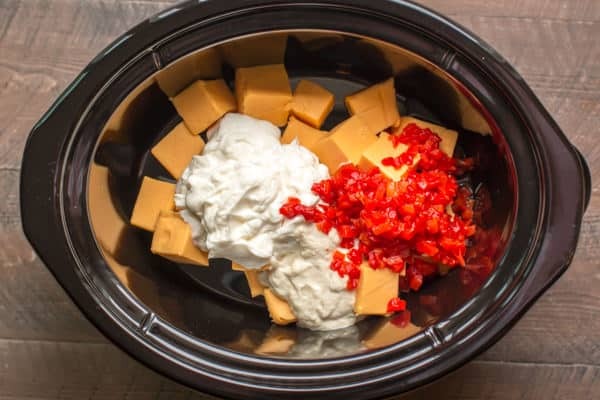 This holiday appetizer Horseradish Cheese Spread is made in the slow cooker but cooled in little containers for holiday serving. 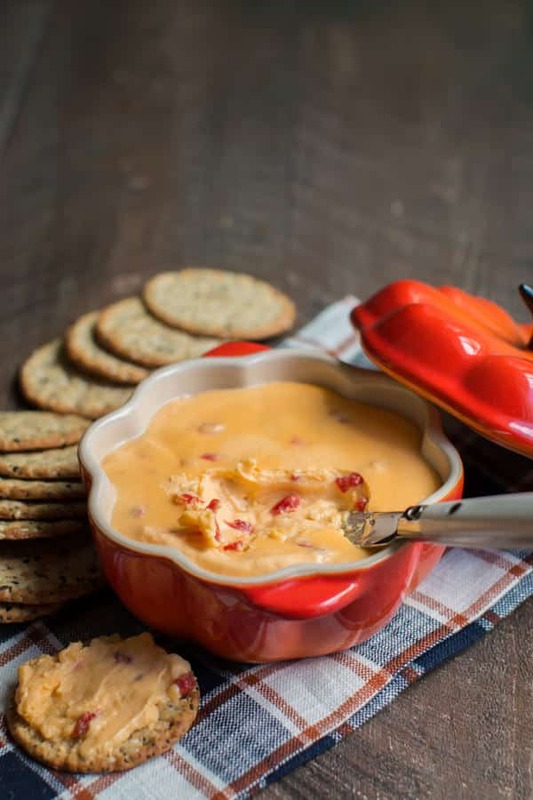 First, before you dive into making this Horseradish Cheese Spread, I want to make sure you know this recipe is for serving cold! This recipe makes a ton for the over holidays or one giant party. 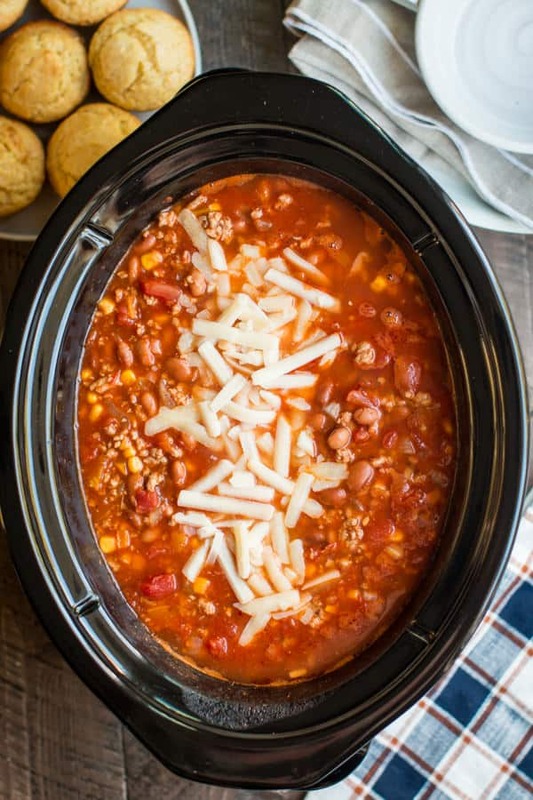 I found this recipe over at Sweet Little Bluebird and had to try it in the slow cooker, Mary got this recipe from her grandpa. I added pimentos for color and my husband and I both love pimentos. 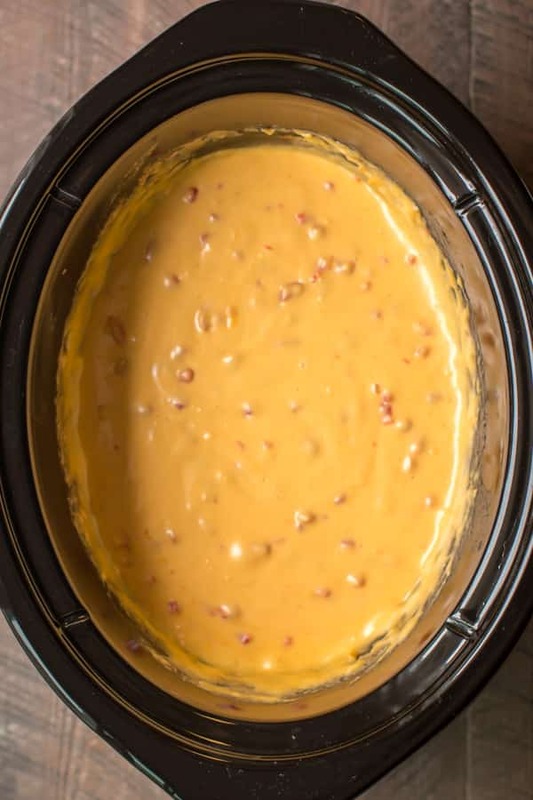 Just cube up the Velveeta and add the other ingredients to the slow cooker. It only took 1 hour and 45 minutes to heat this up in the slow cooker, while I did other housework. After the cheese has melted and there are no lumps in the cheese sauce, I put the warm cheese sauce into little decorative containers with lids, and let cool for about 4 hours in the fridge before serving. What’s great about putting in pretty containers is that during the party you can put out a fresh batch when another is gone. I saw on Mary’s recipe that she used crackers with seeds and Triscuits. I think this spread is best with a cracker with texture to compliment the creaminess of the spread. I hope you give the recipe a try! Enjoy! Cut the Velveeta into cubes, add to the slow cooker. Add the mayonnaise, horseradish, pimentos, and hot sauce, stir. Cover and cook on high for about 1 hour and 45 minutes, stirring about every 30 minutes. Or you can heat this up on the stove pot in a large pan, stir often. 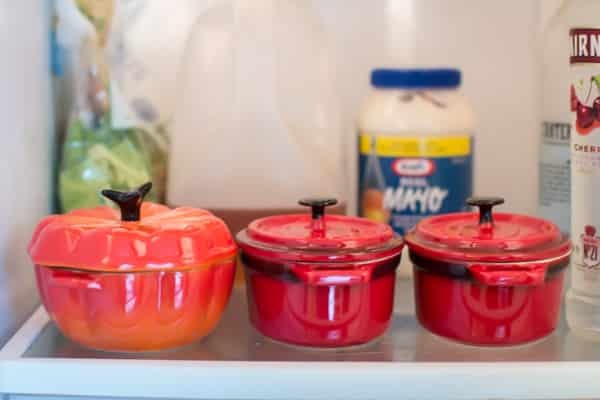 Spoon the cheese sauce into containers with lids and refrigerate for at least 4 hours. 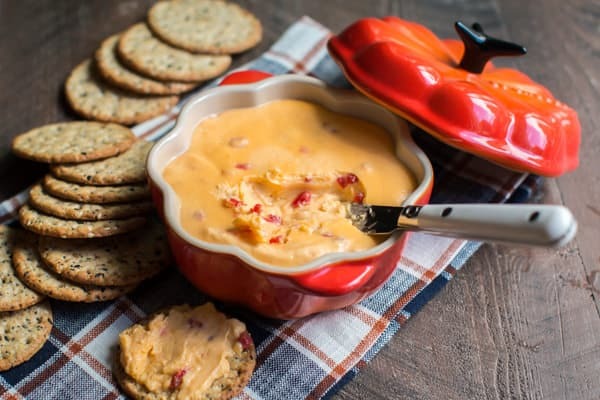 Serve with crackers and enjoy! 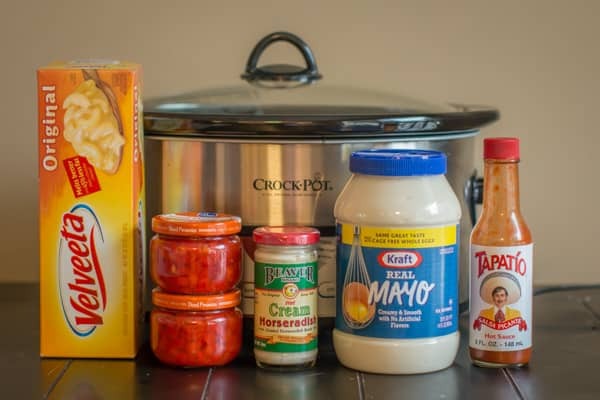 I used my 6-quart Crock-Pot® for this recipe, though any slow cooker 4-quart or larger will work fine. You had me at horseradish, then pimentos! Love the stuff. Where did you get those cut little containers? I would love to gift a serving or two of this to a coworker. The pumpkin one is Le Creuset and the red ones are Staub, they are called cocottes. I found them on ebay. It’s high, I added that. Thank you. I haven’t really had horseradish before, not sure what the taste is. But i will be hosting a white elephant party, would this be a good idea to make as an appetizer? It’s a hot strong flavor. Similar to wasabi in a way. But when mixed into other ingredients (e.g., a Bloody Mary), it is pure delight! How much does it make? How many “little containers” do I need? I’m guessing about 5.5 cups total. If you don’t like mayo, what could you use instead? Possible cream cheese or sour cream? Could you serve this hot in a mini crock pot? Hi Sarah can this be frozen? I’m unsure how it would turn out after being defrosted. Can you suggest a replacement cheese for the Velveeta. We only get to types here in South Africa mostly Gouda & Chedder cheese, the latter being the strong one! Thank you for ALL your recipes we love them! Can another cheese be used in place of the velveeta, it has to much salt in it for me?